Remember the snorting bull from the movie Bull Durham? Of course you remember, because Bull Durham is Kevin Costner’s best baseball movie. That bull was a movie prop. 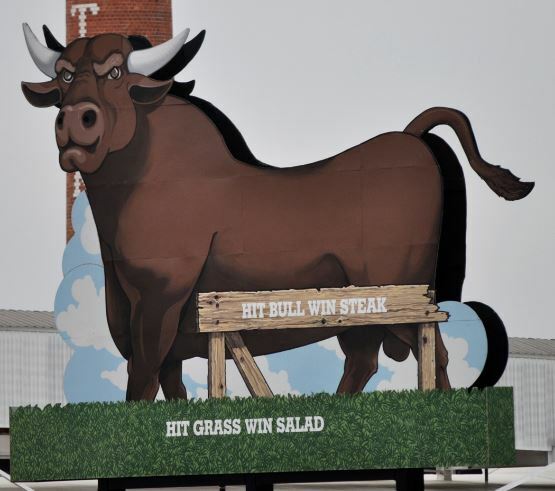 There was no “Hit Bull Win Steak” bull in Durham until the movie dreamed it up. This was a little disappointing. I thought the Durham Bulls had long had a steak-feeding tradition. After all, minor league per diems are pretty slim, even today. A good steak could keep a fella going. I guess it was too much prop to pack up when the movie wrapped – plus, think of all the bubble wrap you’d need – so it was left behind. Movie props aren’t made to last, so it’s a new bull out there in Durham these days. It’s bigger and it’s out in left field now. And, whenever the Bulls homer, anywhere in the park, its eyes light up, its tail wags, and it snorts smoke. Most of the bull-snortin’ home runs come from high fly balls that hit it on their way down. You’d have to really smoke it to line a homer off the bull. You know, smack it right between the eyes. College baseball’s ACC Tournament is underway this week at the Durham Bulls Athletic Park. Lots of smoke-snortin’. But, alas, no steak. College amateur rules are fussy about things like that. But, Sports Channel 8 in North Carolina is providing a “steak dinner” donation to the local food bank in honor of Pinero. Despite the bullish homer, the ‘Hoos lost yesterday’s game against Clemson (and lost to Wake Forest again today). But, Pinero hit the bull. So, there is that. This entry was posted in Baseball, University of Virginia and tagged ACC, college baseball, Daniel Pinero, Durham Bulls, Post-Season, University of Virginia by Jackie, The Baseball Bloggess. Bookmark the permalink. Boohoo, and that’s no bull. With those two losses, the ‘Hoos are out of contention in the ACC tournament. :( National regionals begin next weekend. I think Virginia will get a spot in the post-season, but unsure now, with these two losses, if they’ll still get to host one of the regionals next weekend. Hope so. I could use some more Virginia baseball! I had a friend who’s family business sponsored a class A team back in the early 60s. Their sign on the outfield wall said, “Hit this sign, get a free clock radio.” Legend said that the catcher in 1966 could stand at home plate, and throw the ball over the outfield wall. My friend said his family ended up giving that catcher more than than a half dozen clock radios. The catcher? Johnny Bench. In the 1930s, Ebbets Field in Brooklyn had a sign out in right-center that read “Hit Sign, Win Suit” from a local store. Not sure how many suits the owner gave out, but apparently quite a lot. The guy in Brooklyn was named Abe Stark. He gave both home and visiting players a suit. If you did it more than once, you got more than one suit. Legend has it that one year no visitor hit it so Stark gave Dodgers right fielder Carl Furillo a pair of pants for his work in keeping the sign safe. Don’t know if that’s true, but it is a great story. That story is so good, it HAS to be true. Love it! Plus, they gave the suit to the visiting players who hit the sign, which is awesome. I was disappointed to learn they stopped giving steaks to visiting players who hit the bull. Okay, so this is going to bug me until I get an answer: does the ball have to hit the bull (or the grass) on the fly, or does it count if it bounces first? Inquiring minds, and all that. 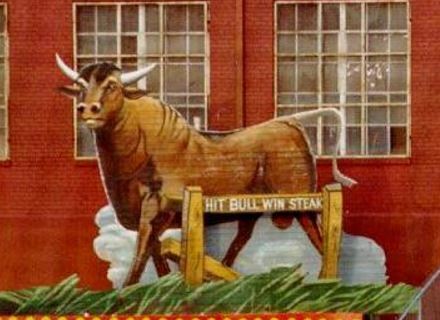 One story I found said that the bull has only been hit 29 times since 1995 when the new park opened and most of the home runs are high flies that hit the bull on the way down. Pinero’s homer hit him smack between the eyes. That’s a great video mash, but the losses really hurt. I thought Virginia should have taken WF, and really they could have beaten Clemson. Now I have to root for WF and, well, you know what other game is happening, soooo…. Good luck! I hope the Cards host a regional no matter what, though. Have a good Holiday weekend. That was quite a game last night — the ‘Hoo’s were whip-smart and jumped on the rare off inning from L’ville’s Drew Harrington. Here’s hoping there’s some regionals baseball for both of us next weekend! My question is answered. Thank you. Let’s hope for a tight game where the pitcher is throwing a two-hitter vs. the Wahoos and shakes his catcher off. Louisville’s star starter rarely has an “off” inning. When he did last night, the ‘Hoos were smart and ready to pounce. Whew. We needed to leave Durham with more than a bull-rattling. The win will hopefully help make the case for naming Charlottesville a host team next weekend. I sure hope so, anyway … I need a little more Hoo baseball at the Dav! Thank you, as always, for remembering all sorts of things that I never would, including the placement of the bull in the movie! I used to live in Durham and attended several Bulls games each season. The Snorting Bull is one of the best parts of the ballpark. I love all the home-spun quirkiness of minor league parks … like a smoke-snorting bull. Just awesome. It would never have occurred to me to research something like this. I love it, though.